As the snow melts, skiers slather on the sunscreen, shed their layers and seek out the best spring skiing. Some New England ski trails are better that others come spring – most notably those still open. Here are a few fine trails that typically offer longer lasting base depth, great scenery and good turns as the snow goes from firm to slush. Ironically several of these terrific trails also afford spectators a good show given their location under the lift. Sugarloaf is “King of Spring” for its northern Maine location and its late season events like Reggafest mid-April. White Nitro, which can be pretty firm midwinter, is finally grip-able in April. This long legendary trail from the upper snowfields is double black diamond, so you earn your bragging rights and your beverage at The Widowmaker overlooking “The Beach” when you reach the base. If Killington is the “Beast of the East” then Superstar is “spring headquarters” at this animal. The name says it all, it’s located under the Superstar Quad – perfect for show offs come spring – often skiing into May. Cascade on Killington Peak, under the K-1 Gondi, is also worth mentioning and worth making spring turns on. Wildcat has Lift Lion, cleverly cat name for this centerpiece trail under the speedy 2,112’ vertical Wildcat Express quad. This trail gets bumped up, has beefy drop offs and beautiful views of Mt. Washington and Tuckerman’s Ravine, and it’s beneath the chairlift. If you ski it well, you may elicit some cat calls from the chairs above. Sunday River’s White Heat has a long legendary spring skiing history. The River is home to spring events Dumont Cup, Eat the Heat Chilifest, SpringFest (formerly parrothead) and Pond a Palooza. Back in the 80’s, pro skier celebs like Wayne Wong would compete with local bump talent in Bust n Burn. Now White Heat, Tempest and Agony bumps are all yours. A few years back “Heat Harvest,” a free skier filmmaker event, showcased young talent on huge jumps made from the waning White Heat snow. Ski the Heat first thing in the morning when its cord, or wait till it softens to corn, then bumps. White Heat is always long, wide, and steep, always with spectators on the fixed grip quad. Great trail thanks to Les Otten. Right Stuff and Monday Mourning with their northern exposure hold the snow well too. Stowe’s National finally softens up come spring time, particularly the headwall. 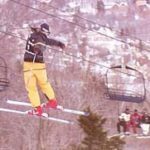 As one of the famed Front Four, it is a rite of passage for Eastern skiers earning their stripes. So ski it, and ski it well since you’re viewable from the Fore Runner Quad, and this is Stowe – you know! Sugarbush’s Lincoln Peak features Stein’s Run were the moguls get bigger and squishier as the day goes on. Of course, there is also aptly named Spring Fling which is typically groomed if you are not quite up to Stein Eriksen caliber car-sized bumps. Cannon’s Vista Way is well named with stunning views of Lincoln and Lafayette in Franconia Notch State Park. 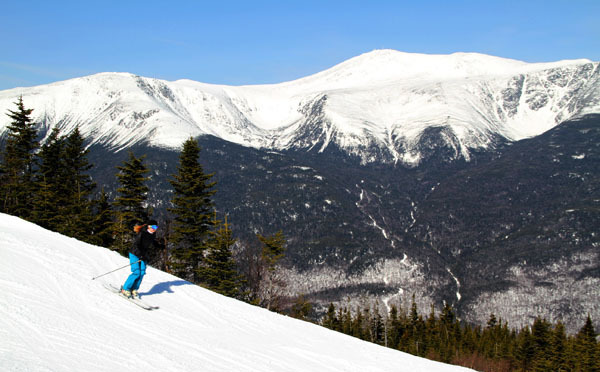 On spring days when the sun comes out, and Cannon’s often firm ski surface turns to corn, this White Mountain is a gem. Loon’s Walking Boss with views of Mt Washington is long, wide and wicked fun when the sun warms it up in spring. North Peak is the highest of Loon’s three mountains at 3,050′ so it has the most snow come spring time. See our Favorite Spring Ski Resorts in the East – for the longest ski seasons and best spring skiing!